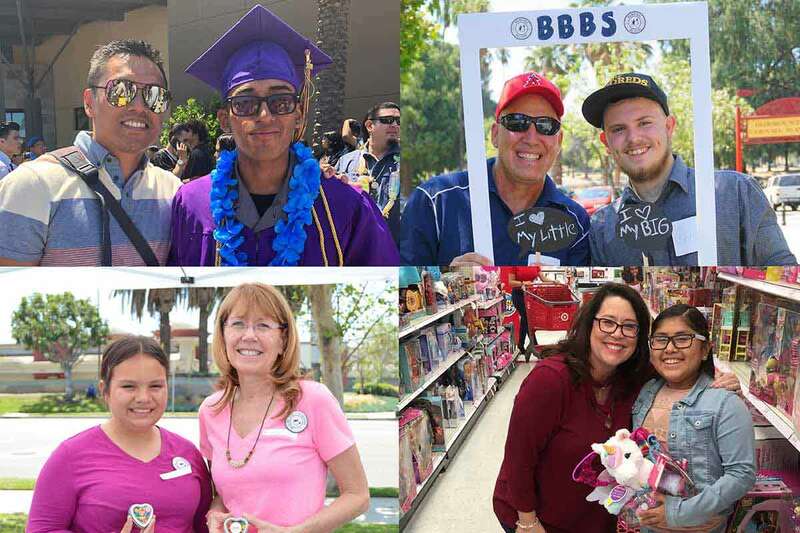 SANTA ANA, Calif. (Feb. 1, 2019) – Youth mentoring organization Big Brothers Big Sisters of Orange County and the Inland Empire announced four inspiring 2019 Big of the Year recipients, topping off this year’s National Mentoring Month public awareness campaign. The Big of the Year award honors volunteer mentors who go above and beyond for the child they are matched with through the program (“Littles”). Honorees typically also contribute greatly to the organization by hosting community fundraisers and recruiting other mentors. The winners were honored Jan. 31 at the annual National Mentoring Month volunteer recruitment and appreciation event, held at Marconi Auto Museum in Tustin. This year, two exceptional individuals were selected from each region for making a difference in the lives of their Littles: Warren Delos Angeles and Chris Atkinson in Orange County, and Joseph Chiado and Leni Zarate in the Inland Empire. Warren Delos Angeles, of Los Alamitos, was matched with Little Brother Jose more than two years ago. Jose was 16 years old at the time, had a strong distrust of authority figures and spent his days ditching class to hang out with the wrong crowd. Delos Angeles, a business owner and father with incredible self-discipline, played an instrumental role in getting his Little back on track after he was kicked out of continuation school. With Delos Angeles’ guidance, Jose enrolled in a military-style residential academy so that he could graduate. In June 2018, he was a proud graduate with straight A’s, a member of the drill team and recipient of the distinguished scholar award. In addition to his ongoing support of Jose, Delos Angeles also raised more than $8,000 for Big Brothers Big Sisters through the October “Tribe Called Bigs” fundraising event at his gym, Tribe Functional Fitness in Los Alamitos. Chris Atkinson, of Lake Forest, is a returning volunteer who first served as a mentor in the late ’90s. That initial match earned her accolades as the 2003 Big Sister of the Year. She still meets with her first Little every month for Taco Tuesday, a testament to the lifelong friendships built through the program. In 2015, she became a mentor to Little Sister Yuritzi, who is being raised by a single mother in Santa Ana. Atkinson loves to encourage Yuritzi’s natural curiosity for life. Through meaningful activities—from planning a budget for their monthly outings to creating her own candy business for the organization’s annual Children’s Business Fair—Atkinson’s Little is learning to harness her entrepreneurial spirit and become financial responsible at the young age of 13. Atkinson also teaches Yuritzi the importance of giving back to the community; last year, they volunteered together at the Big Brothers Big Sisters Sandcastle Day event to serve food donated by Atkinson’s company. Joseph Chiado, of Riverside, has helped 17-year-old Christopher realize that the hardships in his life are not his fault. With his father in prison, Christopher grew up without a consistent male role model to help him navigate challenges such as his learning disability and anger issues. Christopher struggled in school and had no plans for his life after high school. But Chiado broke through to his Little and helped change his mindset with regular church visits and encouraging him to join a youth group to get away from the bad influences in his neighborhood. Last year, when Christopher was diagnosed with cancer, Chiado supported him through the entire treatment process. Today, Christopher has went from planning to drop out of high school to holding a job and touring colleges—breaking through mental blocks and even beating cancer, his mentor with him every step of the way. Chiado is also a member of the Riverside office’s Bigs League, which helps recruit new volunteers to match with local youth. Leni Zarate, of Riverside, met her Little Sister Janely in 2015. At the time, Janely was terrified of speaking up, even if she was being mistreated. With patience, laughter and confidence-boosters like asking her to order for the match at restaurants, Zarate helped the now-11-year-old come out of her shell. When Janely was embarrassed to speak Spanish in public, Zarate encouraged her to be proud of her heritage and asked to be taught Spanish in return. Janely was also several grade levels behind in reading and math because the family moved so frequently, often to rough neighborhoods. Making education a top priority, Zarate attended parent-teacher conferences with Janely’s mother and helped find the best tutors available. Now, Zarate’s Little is bubbly, confident and even a little sassy. Her social skills aren’t all that have improved—she recently received an award for excelling in the two subjects she once struggled to understand. The local Big Brothers Big Sisters National Mentoring Month and Big of the Year campaign is powered by 100 Companies Who Care, a proud sponsor that believes in the ability of youth mentoring to make a life-changing impact for children in the community.